EDGEWATER — Pastor Amos Oladipo and his family have been without a home since a fire tore through the Epworth United Methodist Church's parsonage, where they had lived for more than three years. As the family has spent nights since the fire at the Super 8 Motel on Sheridan Road in Rogers Park, church members have rallied to donate hot meals and help buy the family new clothes, said Oladipo, who splits his time between Epworth and the African Community United Methodist Church in Lincoln Square. "No matter what is going on, God has been in control," he said Tuesday afternoon inside a basement room next door to the charred single-family home. He said both of the congregations he serves had been "very, very supportive." The fire sparked about 5 p.m. April 13 and quickly spread from the first floor, through the wall to the second floor, then into the attic. Oladipo's wife, son and 20-month-old granddaughter were home when the fire started, but everyone was able to get out safely. When the fire started, several homeless men who had been in the church's gym, which holds 65 beds for the neighborhood's homeless, grabbed fire extinguishers in a vain attempt to beat back the flames, said Bruce Greene, who manages the church's property. "They were literally the first responders," he said. Oladipo said he was at a meeting away from the house when he got a call from his family and church leaders, who told him, "Pastor, your house is on fire." Firefighters extinguished the flames before they could spread further, Greene said, but witnessing the historic home burn was like "watching a horror story." "It felt like a lifetime," he said. By the time the firefighters packed up and left, most of the Oladipo family's belongings that had been spared from the flames were destroyed by smoke and water. The amount of damage hadn't been determined, nor had the cause of the fire, although it may have started due to faulty electrical wiring in the house, which the church had bought in 1923, Greene said. On Tuesday, insurance adjusters inspected the building, deciding how much the church would be compensated. Greene, 44, who also acts as the congregation's official historian, said this wasn't the first time the house caught fire. In 1986, when it was being used as office space, an arsonist set fire to the staircase, destroying the home's "sweeping-oak" main staircase, he said. It was then rehabbed and again renovated in 2009 — for about $50,000 — before Oladipo and his family moved into the five-bedroom house, he said. Oladipo, who emigrated from Nigeria in 1989, said he's not sure when his family would find more permanent housing. They estimate it will take six to eight months before the parsonage is repaired. Greene said the church's insurance does not cover the Oladipo family's personal belongings. Oladipo said the greater Edgewater community can make donations online to both the family and church at the Northern Illinois Conference of the United Methodist Church website. Donations can also be mailed to the Chicago Metro Regional Office, 77 W. Washington St., Suite 1820, Chicago, IL 60602. Make checks payable to "NIC" and designate in the memo whether the donation is for Pastor Oladipo and his family or the Epworth Church congregation. "We want to extend our love to the church family and find ways to connect and support Rev. 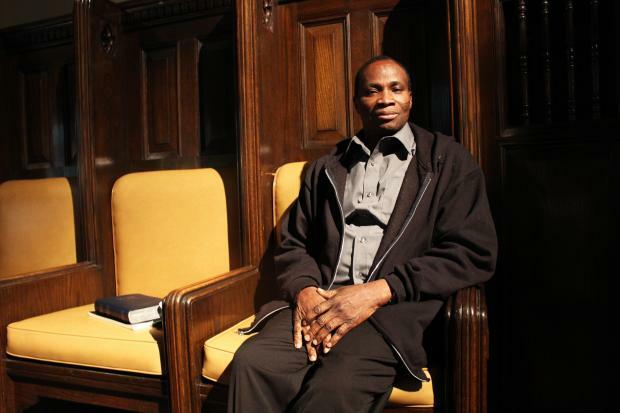 Oladipo and his family during this very difficult time," Zaki L. Zaki, a Methodist Church leader, said in a statement. Greene said the church had been "responding in love and prayers." "It's amazing to see the willingness to serve," he said.